The immunogen used for this product shares 66% homology with CCND2 (seven amino acid stretch with 100% homology). Based on internal testing in WB, this product shows a weak cross-reactivity to Cyclin D2. For IHC usage, this product shows a tissue localization specific to Cyclin D1 with no cross-reactivity to Cyclin D2. Synthetic peptide within Human Cyclin D1 (C terminal). The exact sequence is proprietary. WB: MCF7 cell lysate. ICC/IF: MCF7 cells treated with KN-93 IHC-P: Human esophagus, rat esophagus and human mantle cell lymphoma tissue. Our Abpromise guarantee covers the use of ab134175 in the following tested applications. WB 1/10000 - 1/50000. Predicted molecular weight: 34 kDa. Compared to the working concentration with cyclin D1 recombinant protein, a 50 fold increase is required with cyclin D2 recombinant protein in western blot testing. IHC-P 1/100 - 1/500. Perform heat mediated antigen retrieval before commencing with IHC staining protocol. Note=A chromosomal aberration involving CCND1 may be a cause of B-lymphocytic malignancy, particularly mantle-cell lymphoma (MCL). Translocation t(11;14)(q13;q32) with immunoglobulin gene regions. Activation of CCND1 may be oncogenic by directly altering progression through the cell cycle. Note=A chromosomal aberration involving CCND1 may be a cause of parathyroid adenomas. Translocation t(11;11)(q13;p15) with the parathyroid hormone (PTH) enhancer. Defects in CCND1 are a cause of multiple myeloma (MM) [MIM:254500]. MM is a malignant tumor of plasma cells usually arising in the bone marrow and characterized by diffuse involvement of the skeletal system, hyperglobulinemia, Bence-Jones proteinuria and anemia. Complications of multiple myeloma are bone pain, hypercalcemia, renal failure and spinal cord compression. The aberrant antibodies that are produced lead to impaired humoral immunity and patients have a high prevalence of infection. Amyloidosis may develop in some patients. Multiple myeloma is part of a spectrum of diseases ranging from monoclonal gammopathy of unknown significance (MGUS) to plasma cell leukemia. Note=A chromosomal aberration involving CCND1 is found in multiple myeloma. Translocation t(11;14)(q13;q32) with the IgH locus. Belongs to the cyclin family. Cyclin D subfamily. Phosphorylation at Thr-286 by MAP kinases is required for ubiquitination and degradation following DNA damage. It probably plays an essential role for recognition by the FBXO31 component of SCF (SKP1-cullin-F-box) protein ligase complex. Ubiquitinated, primarily as 'Lys-48'-linked polyubiquitination. Ubiquitinated by a SCF (SKP1-CUL1-F-box protein) ubiquitin-protein ligase complex containing FBXO4 and CRYAB (By similarity). Following DNA damage it is ubiquitinated by some SCF (SKP1-cullin-F-box) protein ligase complex containing FBXO31. Ubiquitination leads to its degradation and G1 arrest. Deubiquitinated by USP2; leading to stabilize it. Immunohistochemistry (Formalin/PFA-fixed paraffin-embedded sections) - Anti-Cyclin D1 antibody [EPR2241] - C-terminal (ab134175)Feng et al PLoS One. 2011;6(10):e26399. doi: 10.1371/journal.pone.0026399. Epub 2011 Oct 31. Fig 1. Immunohistochemistry was performed on human head and neck squamous cell carcinoma tissue using a rabbit monoclonal antibody against the CCND1 protein ab134175 on 3-µm slides using 224 paraffin sections via the standard SP method. Panel C: An example of low Cyclin D1 expression. Panel G: An example of high Cyclin D1 expression. For full image please see paper. MG-63 cells were incubated at 37°C for 24h with vehicle control (0 μM) and different concentrations of 3-aminobenzamide (3-AB) (ab141069). Decreased expression of cyclin D1 (unpurified ab134175) in MG-63 cells correlates with an increase in 3-aminobenzamide (3-AB) concentration, as described in literature. 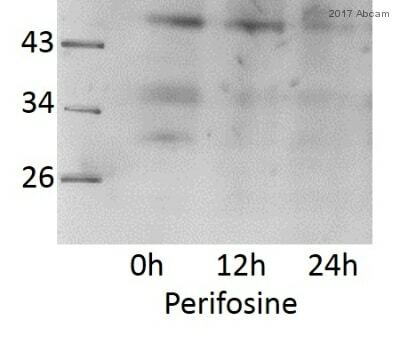 Whole cell lysates were prepared with RIPA buffer (containing protease inhibitors and sodium orthovanadate), 10 μg of each were loaded on the gel and the WB was run under reducing conditions. After transfer the membrane was blocked for an hour using 5% BSA before being incubated with unpurified ab134175 at 1/500 dilution and ab8226 at 1 μg/ml overnight at 4°C. Antibody binding was detected using an anti-rabbit HRP secondary antibody (ab97051) at 1/10000 dilution and visualised using ECL development solution. IHC image of ab134175 staining Cyclin D1 in rat esophagus formalin fixed paraffin embedded tissue sections, performed on a Leica Bond. The section was pre-treated using heat mediated antigen retrieval with sodium citrate buffer (pH6, epitope retrieval solution 1) for 20 mins. The section was then incubated with ab134175, 5μg/ml working concentration, for 15 mins at room temperature and detected using an HRP conjugated compact polymer system. DAB was used as the chromogen. The section was then counterstained with hematoxylin and mounted with DPX. No primary antibody was used in the secondary only control (shown on the inset). Unpurified ab134175 staining Cyclin D1 in MCF7 (Human breast adenocarcinoma cell line) cells treated with KN-93 (ab120980). The cells were fixed with 100% methanol (5min) and then blocked in 1% BSA/10% normal goat serum/0.3M glycine in 0.1%PBS-Tween for 1h. The cells were then incubated with ab134175 at 10μg/ml and ab7291 at 1µg/ml overnight at +4°C, followed by a further incubation at room temperature for 1h with an Goat anti-Rabbit Alexa 488 secondary (ab150081) at 2 μg/ml (shown in green) and Goat anti-Mouse Alexa 594 secondary (ab150120) at 2 μg/ml (shown in pseudo color red). Nuclear DNA was labeled in blue with DAPI. Negative controls: 1– Rabbit primary and anti-mouse secondary antibody; 2 – Mouse primary antibody and anti-rabbit secondary antibody. Controls 1 and 2 indicate that there is no unspecific reaction between primary and secondary antibodies used. IHC image of ab134175 staining Cyclin D1 in human esophagus formalin fixed paraffin embedded tissue sections*, performed on a Leica Bond. The section was pre-treated using heat mediated antigen retrieval with sodium citrate buffer (pH6, epitope retrieval solution 1) for 20 mins. The section was then incubated with ab134175, 5μg/ml working concentration, for 15 mins at room temperature and detected using an HRP conjugated compact polymer system. DAB was used as the chromogen. The section was then counterstained with hematoxylin and mounted with DPX. No primary antibody was used in the secondary only control (shown on the inset). Immunohistochemical staining of paraffin embedded human endometrial adenocarcinoma with purified ab134175 at a dilution of 1/100. 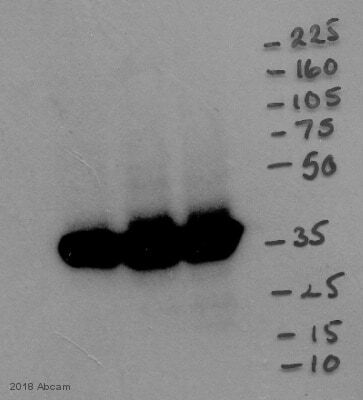 An HRP goat anti-rabbit (ab97051) was used as the secondary antibody at a dilution of 1/500 and the sample was counterstained with hematoxylin. Antigen retrieval was perfomed using Tris-EDTA buffer, pH 9.0. PBS was used instead of the primary antibody as the negative control (inset). Immunohistochemical analysis of paraffin-embedded human mantle cell lymphoma tissue, labeling Cyclin D1 with unpurified ab134175 at 1/100 dilution. Lysates/proteins at 0.015 µg per lane. 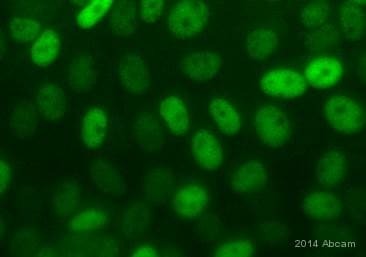 Immunofluorescent staining of Ramos (Human Burkitt's lymphoma cell line) cells (fixed in 4% PFA, permeabilized with 0.1% Triton X 100) using purified ab134175 at a dilution of 1/50. An Alexa Fluor® 488 goat anti-rabbit antibody was used as the secondary at a dilution of 1/500 and the cells were counterstained with DAPI. The negative control is shown in the bottom right hand panel - for the negative control, Alex Fluor® 594 goat anti-mouse was used at a dilution of 1/500. Immunocytochemistry/ Immunofluorescence - Anti-Cyclin D1 antibody [EPR2241] (ab134175)This image is courtesy of an Abreview submitted by Kirk Mcmanus. Immunocytochemical analysis of HeLa (Human epithelial cell line from cervix adenocarcinoma) cells, labeling Cyclin D1 with ab134175 at a dilution of 1/200. Cells were paraformaldehyde fixed and permeabilized with 0.5% Triton X-100 in PBS. Incubation with the primary antibody was for 1 hour at 22°C. Cells were counterstained with DAPI following immunostaining. 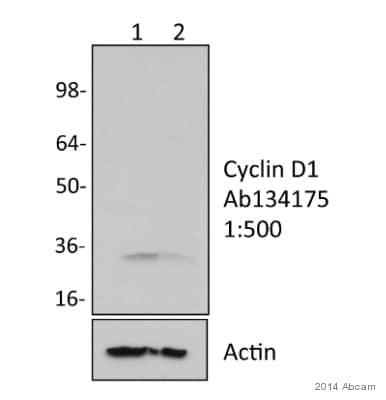 ab134175 (purified) at 1/30 immunoprecipitating cyclin D1 in A431 (Human epidermoid carcinoma cell line) cells. 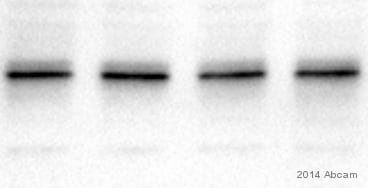 For western blotting, an HRP-conjugated goat anti-rabbit IgG, was used as the secondary antibody (1/1000). Blocking/Dilution buffer and concentration: 5% NFDM/TBST.